Pours a pink-tinted pale straw color with a massive, slow-forming, airy, pink-hued head. Leaves a crown but zero lacing. Dry rice, tartness and strange fruit in the nose that leaves an impression of vomit with a hint of faux movie theater popcorn butter. One of the more off-putting aromas I've smelled in a beer. The taste thankfully loses the vomity note. It's very sweet and fruity up front. I haven't had dragon fruit and loquat before. It reminds me of watermelon candy. There's a slightly tart, dry, puckering finish that's actually quite refreshing. It's on the light side of medium bodied, with just little syrup quality and nice carbonation. Another super-fruity Berliner from these guys that strays into novelty beer / wine cooler territory. 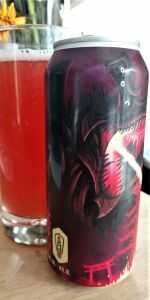 As these type of sweet beers go, I liked the fruit flavor of their "Stealth Mode" blueberry Berliner Weisse a lot better, but the finish in this one is actually quite nice. Just don't sniff it too much. No canned on date. A: Pink. Obviously. Bright pink, slightly opaque but clean. A tiny off white head recedes into a minimal ring around the glass. No lacing what so ever. A: Smells like straight up cranberry apple Martinelli's. Some grapefruit and watermelon Jolly Ranchers. Maybe a hint if simple syrup. As it warmed, couldn't help but notice some Strawberry Quik as well. How's that for shameless advertising? T: Seriously tastes like watermelon Jolly Ranchers, with a nice light tartness and hints of wheat on the back end. Strawberry Quik comes on as well when this warmed. F: Has a crisp, sharp bite to it and just a bit under "spritzy". Nice and light, not at all puckering but good amount of tartness. Very good drinkability on this hot and humid day. O: This is another very fun beer from Bottle Logic, which doesn't surprise me. They have knack for entertainment. Overall, I'd love this beer as a regular alternative to a Gose, or session beer of any sort. It's unique, fun, and most importantly.. delicious. Pale orange brew with a light cream colored head. Retention is fine; little lacing worth mentioning. Sharp and fruity aroma: tangy, showing the dragonfruit and citrus. Sweet, light, and fruity; much closer to fruit juice than beer. While the ABV is fairly low (5%), even that much is hidden. Tart but not particularly sour. Radler-esque. Definitely crushable. An enjoyable brew, with a good amount of fruity flavor despite the low ABV.